RCS is a hot topic for businesses across the globe at the minute, with most businesses preparing for the huge benefits that RCS will bring them and their customers. RCS messaging gives businesses a completely new and unique way of communicating with their customers, while customers are presented with a better way to interact back with the business. For those that have never heard about RCS, it stands for Rich Communication Services and is an upgrade from SMS. 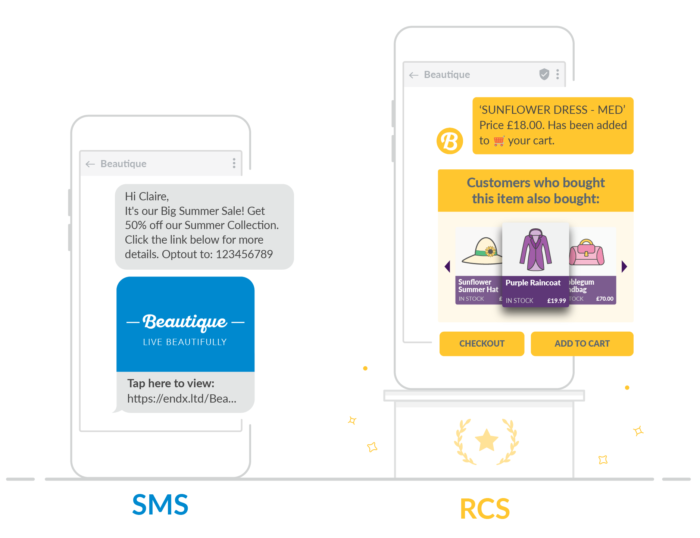 RCS messaging allows consumers to interact with their favourite brands from within their phone’s native messaging app, from booking an appointment with a click of a button, to selecting and making a purchase without leaving the messaging app. A more streamlined solution for both parties. To further explain RCS, it is similar to OTT messaging channels like WhatsApp, where you can send images, videos, and emojis. 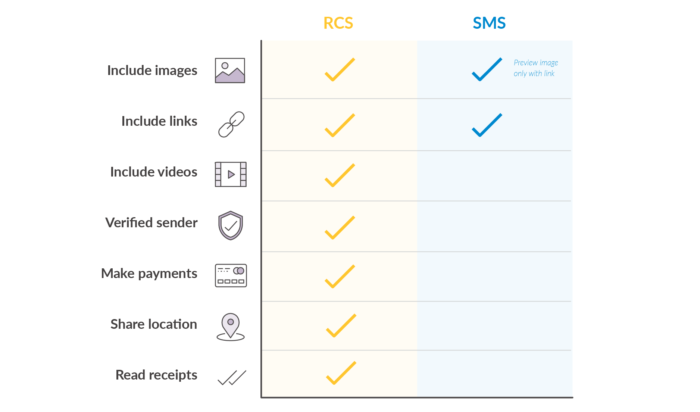 When comparing RCS to SMS, you can compare the functionality of WhatsApp and SMS. With WhatsApp you can send pictures, RCS also offers this and much more. With RCS on the horizon does this mean that it is the end for SMS? SMS was created for simple communication, whilst RCS has been developed to enhance that communication and bring it into the modern world. As RCS is an upgrade to SMS there are some major differences between them both. Delivery and read receipts: RCS will allow you to see if the recipient has opened and read the message. Currently we know that 94% of all text messages are opened, but with RCS we will be able delve deeper into the analytics and see the read rate. Verified sender: RCS will help eradicate fraud with verified sender. Similar to Twitter’s blue tick, RCS will make it mandatory for businesses to be a ‘Verified Sender’. So when a customer receives an RCS message from a business, because it is verified and branded with the business’s colours, the customer will know that they have received a legitimate message. Include images and videos: Including images and videos within the body of your messages will be more engaging for the recipient, increasing the chance of a purchase, as 64% of women who shop for apparel on a mobile device say images influence their purchasing decisions (Source: Google). Businesses will be able to add a carousel of images, giving customers various options, dynamic images, like including a picture of the engineer coming to visit them, to aide consumer trust, and even include QR codes, which will work especially well for ticket systems such as airlines. Share your location: If you have a physical store or a location for an event, you will be able to include where you are on a map, making it easier for people to find you quickly. Make payments: One of the big features that businesses can’t wait for with RCS, is the option to include a purchase button in the message. Meaning the consumer wouldn’t be required to leave the messaging app screen to buy your product, they would simply click a button. Simple messaging: SMS offers businesses a simple way of communicating with their customers, with a text message being from 1 to 612 characters in length. Include links: SMS allows businesses to include links in the body of the message. This is great if you want people to go to your website to place an order or landing page to capture information. One simple call to action link means customers won’t get confused over what you want them to do. Include preview images: SMS doesn’t allow you to physically attach an image to the text message, but you can include a link that shows a preview image of the linked page. With all these new features that RCS will bring to the table, does it mean sending a simple text message is dead for businesses? The answer is no. SMS has been around for over 25 years, it has stood the test of time and continues to grow to this day. SMS is not dead and is still seen as one of the most effective channels for business communication. Millions of businesses are only scraping the surface with what SMS can do and with the improvements that RCS will bring, it can only help to further improve communication and future proof this channel. We are very excited with the prospect of what RCS can do for businesses and know how powerful it can be, we also understand that some businesses are happy to stick with a simple SMS message. Which is why Esendex will continue to offer both these solutions, to best suit your business needs. If you want to learn more about how RCS can help your business, have a read of our fantastic blogs here.